LEDs : The MODRATEC Shop, Send the right signals! Pack of 12 green 3mm LEDs plus 12 680-ohm resistors to suit 12V dc operation. Instructions included. Pack of 12 yellow 3mm LEDs plus 12 680-ohm resistors to suit 12V dc operation. Instructions included. 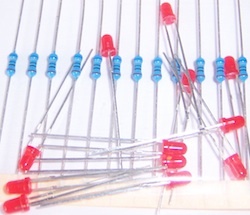 Pack of 12 red 3mm LEDs plus 12 680-ohm resistors to suit 12V dc operation. Instructions included.